A multi-faceted eye serum created for all skin types suffering from a combination of eye area skin issues including: sagging eye contours, glycated and discolored skin, dark shadows, puffiness, deep lines and wrinkles. 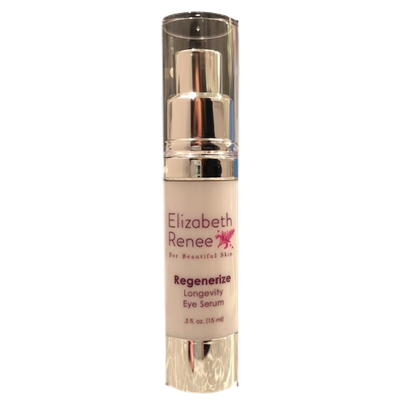 WHY REGENERIZE LONGEVITY EYE SERUM? aging eye experiences, including - the most difficult area to treat – the sagging upper lid. It visibly firms, lifts and sculpts eyelid contours completely around the eye area, without heaviness or weighing that area down. Beautifeye™ - noticeably lifts and firms upper eyelids, reduces wrinkle depth, puffiness, dark circles, and increases volume and tissue density. Liposhield™ - shields from aging HEV light from cellphones, computers, tablets, smart TVs. Niacinamide - cell builder for healthy surface barrier, vital cell vigor and enhanced radiance. Mung Bean Sprout Stem Cells - Offers air pollution protection, flexible firmness, and decreased sensitivity. In the morning and evening, after applying other serums but before moisturizer and sunscreen, gently smooth a pearl size amount in circular motions around the eye orbit (above and below) to tighten the contour of the eye. Smooth in the direction of brow hairs. Use the remainder to soften lip lines.